In a battle between Harry Potter and the Prophet Mohammed, the Prophet scores a knock-out. The battle is being waged in hospitals all over Great Britain and the name "Harry" is taking a beating. 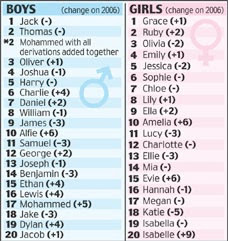 In a ranking of the most popular baby names for boys in the U.K., "Mohammed" now ranks second; "Harry" is a distant fifth. "Jack" remains the most popular British name for baby boys: it's been the 13th year in a row that the name has topped the baby name popularity charts. But its days at the top of the list may be numbered. It's multiculturalism and Islam's rise in Britain, as measured on the list of baby boy names and their popularity. In the baby girl name department, no such shift has been noticed. Cultural shifts are measured by many factors. The popularity of the name "Mohammed" for baby boys is but one. It's rare when a statistic not makes a comment on culture, but also helps forecast the future. The list of popular baby boy names provides one such rare statistic.